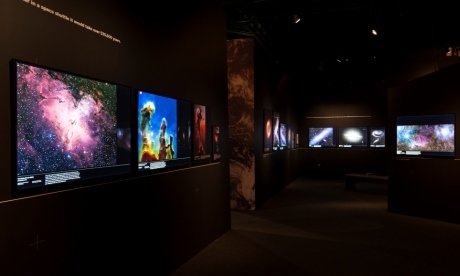 Given my recurring Picturing Science posts in this blog, I can’t avoid mentioning the new exhibition that has opened at the National Maritime Museum, Visions of the Universe. (Full disclosure: I have not been involved with this exhibition at all.) It has been getting some really nice reviews and previews, and anyone with an interest in astronomy or photography should make the trip. In this post, though, I want to highlight something else that is currently on view, within the main (free) museum. While the exhibition showcases what the space age has brought us, with extraordinary Hubble-type images and – the real hit, I think – a 13-metre long Mars Window, this other display offers the clearest possible reminder of how recently it is that any of this became possible. 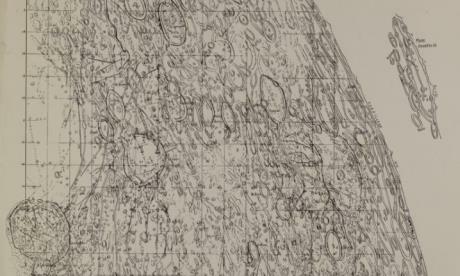 In the NMM’s Compass Lounge (at the rear left of the Museum’s new entrance foyer), the several sheets of a 1951 map of the moon have been photographed and reproduced to show the complete 300-inch chart. It shows an extraordinary level of hand-drawn detail, achieved by its maker, H. Percy Wilkins (1896-1960), with the aid of distinctly earth-bound telescopes. 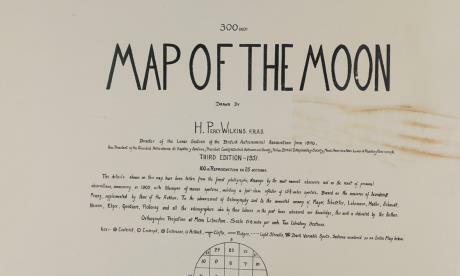 This map, versions of which he had been working on since the 1920s, was the largest-scale and most detailed of its time, combining Wilkins’ personal observations with data from the drawings, photographs and measurements of other astronomers. As his Wikipedia entry says, it was “considered by some as the culmination of the art of selenography prior to the space age”. Wilkins himself described it as “the World’s greatest Moon Map”. The map was also, perhaps, one of the last productions of its kind. Not only was it published just on the cusp of the space age, but it was also the project of an amateur, working from his home near Bexleyheath with a 12½-inch, and later a 15½-inch, reflector. Wilkins did the work in his spare time, being employed first as a mechanical engineer and then a civil servant at the Ministry of Supply. 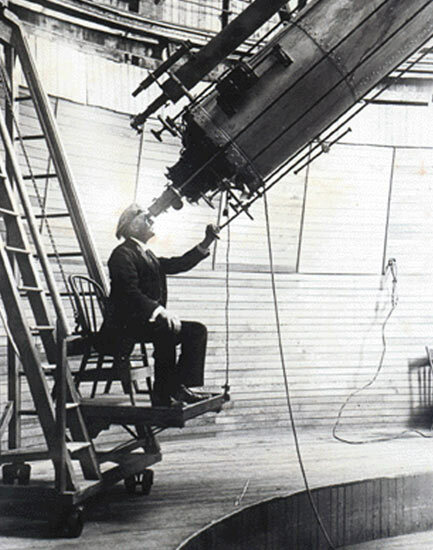 Wilkins nevertheless found time to make telescopes, publish several works on popular astronomy and act as director of the British Astronomical Association’s Lunar Section. As well as founding the Section’s periodical The Moon, he was also, late in life, the first president of the International Lunar Society. Two of Wilkins’ books were co-authored with another selenographic authority, Patrick Moore, to whom the Visions of the Universe exhibition is dedicated. I found online a reminiscence of Wilkins by an acquaintance describing him as a “proto-Patrick Moore”, but he was perhaps also a direct inspiration. In an obituary of his colleague, Moore wrote of the “prodigious amount of work” that went into the mapping project but, also, that “his personal enthusiasm was inspiring”. Moore felt a “deep sense of personal loss”. Wilkins did not quite become the media star that Moore did, but he made “numerous broadcasts and television appearances”. You can, for example, see him (his telescope, his map, and his daughter) here in a 1953 Pathé newsreel. Somewhat more infamously, he made the news in 1954 when he announced his observation of “the most extraordinary feature known on the moon today”. This was a curved shadow, already spotted and described as bridge-like by an American astronomer, John J. O’Neill. It was reported as a 20-mile arch, which can be seen clearly in the photographs reproduced in one of the newspaper reports, viewable at the bottom of the page here. It was, however, no more than a trick of the light, rather like the Face on Mars. The episode seems to have damaged his credibility considerable and may be one of the reasons that he is less than well-remembered today. Part of the problem was that Wilkins spoke to the press and on the radio before submitting his, rather more cautious, observations to peer scrutiny, His case was not aided by his initially appearing to hint that the structure could be evidence of life on the moon: phrases like “looks artificial” and “almost like an engineering job” led some to leap to such conclusions, even if they were simply descriptive. The “bridge” was not included in Wilkins’ map, although it did incorporate some other erroneous details. Nevertheless, NASA purchased at least one, and possibly several, copies of the reduced reproduction of his lunar chart when preparing for the Apollo moon landings. His map was also used to help match up the first photographs of the far side of the moon, produced by a Lunar 3 in 1959, with features visible from Earth. As well as the originals of three editions of the maps themselves, the Museum also received a number of notebooks, all kindly donated by Wilkins’ daughter. The notebooks include formulae, photographs, newspaper cuttings, original drawings and observational notes, from Wilkins’ Kentish observatory and visits to professional observatories in France and the US. They are testament to his years of dedicated work. When you go (as you must) to see the images, the ingenuity and the leaps that have been made in professional and amateur astronomical imaging on display in the major exhibition, do also remember to pop over to see “the World’s greatest Moon Map”. Is there ‘a rising tide of irrationality’? I often come across the assumption, or assertion, that pseudoscientific views or belief in the paranormal are increasing. Yet the claim that there is a “rising tide of irrationality” seems to be backed by little evidence. This certainly chimes with my view as an historian. Loxton also pointed me to a piece on the data collected since 1990 by Gallup that indicates “the public’s persistent belief in the paranormal”. While particular types of paranormal interest come in and out of fashion, overall it seems that views considered non-, anti- or pseudo-scientific have a fairly static presence. So why the assertion that it is increasing? Perhaps today we can point to the potential for visibility and collective presence generated by the internet. There are also new ways in which unscientific views have entered the political arena, making them more visible and problematic – something recently discussed by Erik M. Conway and Naomi Oreskes inWhy Conservatives Turned Against Science. Take astrology, for example. It was once intimately connected with astronomy. The words were more or less interchangeable in the early modern period, although for simplicity we can characterise astrology as having been one of the most significant drivers for accurate positional astronomy, alongside timekeeping, surveying and navigation. By the end of the 17th century, for elite astronomers, this connection was disintegrating and, although their data continued to be used by astrologers, the borders between legitimate and non-legitimate uses of astronomy were redefined. 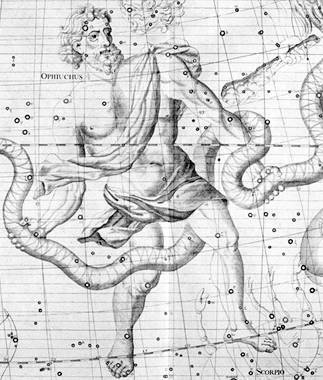 The astrologers did not go away, and popular belief in the effect of heavenly bodies on the mundane world – on individuals, nations, crops, weather or health – certainly remained throughout the 18th century and beyond. A market for astrological publications and symbolism continued to exist, even if it was not until the late 19th century that there was a notable revival of interest in astrology and other things esoteric and spiritual among more fashionable and educated audiences. One place in which we can trace this ever-present undercurrent of astrological belief is, of all places, in the archive of the Royal Observatory in Greenwich (now held at Cambridge University Library), where a quick search of the online catalogue reveals that Astronomers Royal throughout the 19th and 20th century had to deal with enquiries from the public relating to astrology. Undoubtedly there was such correspondence in the 18th century too, it simply was not kept as diligently. Astrological enquiries of the mid 19th century – before the revivals of either late 19th-century esotericism or the 20th-century’s New Age – were also referred to in a published account. This was The Midnight Sky, written by one of the Observatory’s assistant astronomers, Edwin Dunkin. Dunkin’s “final example of the march of intellect in the nineteenth century” was a letter received more than 30 years before: “I have been informed that there are persons at this Observatory who will, by my inclosing a remittance and the time of my birth, give me to understand who is to be my wife. An early answer, stating all relative particulars, will greatly oblige”. Astrological questions, or ones on Mayan prophecy or UFOs, still come to places like the Royal Observatory. We can at least comfort ourselves with the knowledge that this puts us in esteemed company, and that ’twas always thus, and ’twill ever be. Over history, changing technology has brought Mars ever closer to us, before it finally took us to it. However, what technology couldn’t definitively supply, human imagination has always been ready to provide. So long as they were Earth-bound, astronomers were limited not only by the capabilities of their instruments but also by the atmosphere through which they peered. The motion of the air makes the detail of planetary surfaces flicker and deceive the eye. Tantalisingly clear glimpses appear when the air stills, which, pre-photography, had to be committed to memory and reproduced in sketches. Robert Hooke, working with a small-lensed refracting telescope in 1666, described the difficulties of observing Mars: “I could find nothing of satisfaction, though I often imagin’d, I saw Spots, yet the inflective veins of the Air … did make it confus’d and glaring, that I could not conclude upon any thing.” Yet, at the same period, Christiaan Huygens and Gian Domenico Cassini (celebrated in the Cassini-Huygens Mission) noted the presence of distinct features, including white areas toward the poles and patches identified as bogs. William Herschel, a pioneer of large reflecting telescopes, quickly came to the conclusion that the white areas were ice caps. In 1784 he further reported to the Royal Society that Mars “is not without considerable atmosphere”, with evidence of clouds, and that “its inhabitants probably enjoy a situation in many respects similar to our own.” The instinct to describe what were, necessarily, incredibly indistinct features with words with terrestrial connotations undoubtedly reinforced the sense that Mars was Earth’s mirror. By the 19th century, the magnification and light-gathering power of reflecting telescopes had increased dramatically, allowing a much greater degree of detail on the surface of Mars to be defined. Of course, more visible features gave eyes and imaginations more to play with. This was the great age of Mars mapping, an effort that led, inevitably, to the fixing and defining of ever-more Earth-like features. Latitude, longitude and prime meridians were marked, and features were labelled. Initially, noncommittally, they were given alphabetical labels but very soon they had European names and, just as with far-flung parts of the Earth, naming and mapping implies knowledge and possession. In 1867, the great astronomy populariser, Richard A. Proctor, published a map of Mars that gave hard, defined edges to features that had, so far, been softly rendered. Suddenly appearing as seas, islands and inlets, they carried the names of astronomical heroes. Proctor confidently wrote of “land and water, mountain and valley, clouds and sunshine, rain and ice, and snow, rivers and lakes, ocean current and wind current” that, surely, were serving the needs of Martian life. The best known products of this Martian mapping mania, and the apex of the desire to see terrestrial and mundane forms in space, are the “canali” (channels in Italian, but quickly read in English as “canals”, an artificial structure) mapped by Giovanni Schiaparelli from Milan, and run away with by Percival Lowell in Flagstaff, Arizona. Lowell eventually “saw” and published maps of not only canals but also vastly thick lines of cultivated vegetation, oases and cities, standing out against “one vast Sahara”. It was a vision of a drying, dying planet being managed by an advanced civilisation. Lowell, a traveller and orientalist, wrote of Mars as if he had actually been there. These claims did not convince all but they proved hard to dislodge. In the early 20th century photography was not able to provide much assistance. Fascinatingly, Lowell’s assistant C O Lampland was awarded the Royal Photographic Society’s medal for successfully capturing an image of the canals. You can see Lampland’s photographs, and a fascinating discussion of them, in this 1921 article in the journal of the Astronomical Society of the Pacific. The picture above marks one of a number of attempts to undermine Lowell’s claims. 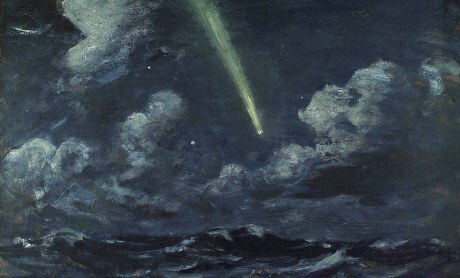 It was published in a 1903 article by E Walter Maunder, an assistant at the Royal Observatory, Greenwich, who had already pointed out the issues surrounding the weakness and suggestibility of human perception, especially when observing at the limits of vision and making records based on memory. Maunder described an experiment undertaken with boys of the nearbyRoyal Hospital School. The boys – who, as future naval officers, were trained in observation and draftsmanship – were placed at various distances, shown a soft, shaded interpretation of the Martian surface and asked to draw it. As the results above show, several of the boys readily made out straight lines where none appeared in the original – either because they were already familiar with Lowell’s ideas or, as Maunder claimed, because the eye resolves dots and patches into lines at a distance. The Martian canals had a surprisingly long life, and not only in the popular imagination. Assumptions that there was, or had been, intelligent life on Mars remained dominant into the 1940s and 50s. The hope of finding large organisms, at least, was still alive in the 1970s, as the probe Mariner 9 beamed back images of dried river beds. Today, Curiosity has set wheel on the Martian surface, and demonstrates that, although hopes of finding life have faded, the interest in environments that could be cultivated by an intelligent species into a habitable world remain with us today. to apply himself with the most exact care and diligence to the rectifying the tables of the motions of the heavens, and the places of the fixed stars, so as to find our the so much-desired longitude of places for the perfecting the art of navigation. I have another post on the topic of “Astrology is rubbish, but…” thas has just appeared as a guest post on Martin Robbins’ The Lay Scientist. Very many thanks to Martin for agreeing to host, and offering his readers a different view to the one he put across a few says ago in “Astrologers angered by stars”. Comments are kicking off nicely – with some people evidently actually understanding what I was trying to say. Others not. Oh well – we try. I had another thought – a pensée d’escalier – last night about the meaning of skepticism (though not, for the philosophers here, in the technical sense). It sometimes becomes confusing in such debates as to where skepticism sits and what it means. Being skeptical of astrology is good, being skeptical about climate change is bad. But let us remind ourselves that the etymology of skepticism implies enquiry and reflection, not dismissiveness. This may help sort out the real skeptics from the rubbishers!